One of the many ironies of Cecil B. DeMille’s career remains the collision between his long-standing commitment to research and the fevered, over-baked nature of his plots. One gets the sense that the director enjoyed dousing his imagination in the details of actuality only to send the majority of them up in smoke as soon as he committed plot to paper and image to celluloid. You get the sense that he was never willing to let facts stand in the way of spectacle, as the information he had his minions amass toppled simply in the process of reproducing a body of factual data. This characteristic is particularly potent in The Godless Girl, his last silent feature and the final independent production he completed before returning to his former home base of Paramount Pictures. Apparently, DeMille was riveted by stories he uncovered of atheist students forming communities of interest in public high schools as well as the squalid conditions in detention centres set up for miscreant adolescents. He joined the religious subject and the social documentation together into an over-the-top concoction that would send the mind reeling were it not for the director’s well-honed ability to capture extreme emotions and imagine potent images of social spectacle. For however many times The Godless Girl stretches the fabric of dramatic conviction, the undeniable competence of DeMille’s cinematic craft saves the film from being little more than a camp classic. The narrative pits the heated atheism of a young woman, Judy (Lina Basquette), against the equally fevered convictions of Bob (Tom Keene, billed as George Duryea). The latter crashes a meeting of Judy’s band of fellow controversialists, and a riot ensues. 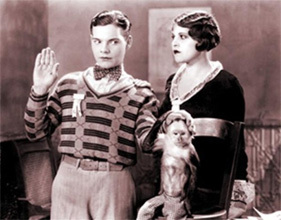 A young woman is accidentally killed, and the two protagonists, along with the comic figure and secondary lead Bozo (Eddie Quillan), are convicted of manslaughter and sent to a juvenile detention facility. Conditions of the most punitive nature prevail, although the plot is sparked by the ensuing romance between the protagonists, abetted by the actions of the secondary female lead (Marie Prevost). The institution’s head guard (Noah Beery) rules the adolescents with an iron fist and complete lack of sympathy. Any abrogation of the rules is met by brutal physical punishment. Bob and Judy manage to escape, only to be recaptured and placed in solitary confinement. A fire breaks out and traps Judy, whom Bob rescues but only after battling the sadistic guard and braving the collapse of the building in which she is housed. His heroic and selfless action convinces the repentant and now expiring guard to advocate for the young people’s liberation. Their philosophical altercation behind them, as well as their incarceration, the couple return to society, although the remorse of the guard is not necessarily coupled with any substantial alteration of the institution that employed him. The commercial failure of The Godless Girl can be, in large part, blamed on the collision of DeMille’s silent feature with the hegemony of sound. The release version of the picture incorporated some brief talking segments, which DeMille neither sanctioned nor supervised. However, one must also add that the film’s leads fail to linger in the imagination, and their subsequent lack of significant stardom does not come as much of a surprise. (Basquette barely broke the audience’s attention in future years, while Duryea as Keene appeared in an array of “B” westerns and, lastly, Edward D. Wood, Jr.’s Plan 9 From Outer Space .) They serve adequately as iconic figures of thwarted youth, but little more. Beery bares his temper memorably, as he had in the silent version of Beau Geste (Herbert Brenon, 1926) and elsewhere, and Quillan evidences the one-dimensional, but far from unappealing qualities that made him a long-standing comic bit player. All that pales, nonetheless, in the face of DeMille’s considerable skill at marshalling spectacle and heating up the audience’s emotions. The riot at the film’s start and the conflagration at its finish possess undeniable vigour and exhibit considerable technical finesse. The earlier sequence in particular illustrates the director’s skill at editing action as well as his creative use of technology. DeMille employs a zoom lens to reinforce the jarring nature of the young woman’s death as well as an elaborate crane shot in order to vividly display the assault upon the atheists’ stronghold. The final sequence builds effectively through the tempo of the editing and the evidently far from artificial flames that threaten the protagonists. However, the episode that most rivets the viewer and remains in one’s imagination must be the near electrocution of the lead players. They attempt to make contact through a steel-wire fence without knowing that it has been electrified. The guard turns on the power, and the force of the current excruciatingly sears both characters’ palms. Subsequently, they bond through the similarity of their wounds as well as reinforce their growing likeness of mind by the fact that their virtual stigmata when held at a certain angle resembles a cross. The rank audacity of the image, as well as its impressive literalisation of the picture’s religious theme, virtually takes one’s breath away, yet possesses an undeniable force of expression. One could never accuse DeMille of subtlety, nor can one dismiss him for boring an audience. The Godless Girl never risks the former condition nor does it engage in the inconvenience of the latter. On several occasions, it sears itself into one’s memory as successfully as that sinister fence slices into the protagonists’ flesh. David Sanjek was appointed Professor of Music and Director of the Centre for Popular Music at the University of Salford, U.K. in October 2007. His piece “Fans’ Notes” was reprinted in the Cult Film Reader (Open University Press, 2007), and he is readying two books for publication: Always On My Mind: Music, Memory and Money and Stories We Could Tell: Putting Words to American Popular Music.